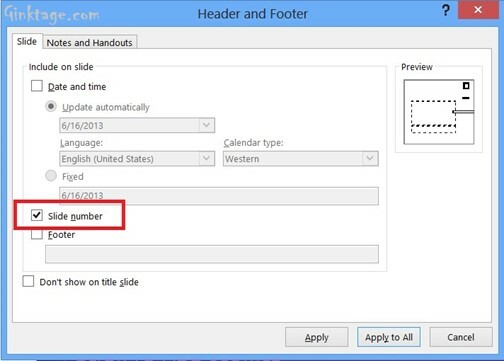 How to Insert Slide Number in PowerPoint 2013 Presentation? This article will explain how to insert the slide number in Microsoft PowerPoint 2013 presentation. If you are a use working in Microsoft PowerPoint 2013, you might sometimes want to display the slide number in your presentation. You can easily do it by following the below steps. 1. Launch Microsoft PowerPoint 2013 and Open your Presentation file. 2. Navigate to the Insert Tab in the Office Ribbon and click the Slide Number button. 3. 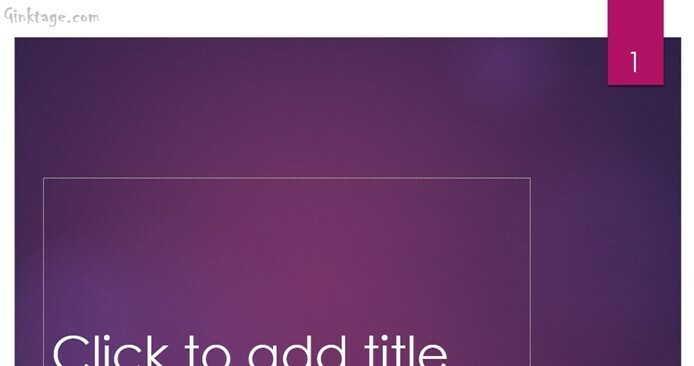 This will display the “Header and Footer” Dialog. In the Slide tab of this screen, check/enable the option “Slide Number” and click Apply to All button. 4. This will now display the slide number on the top right corner of the screen.